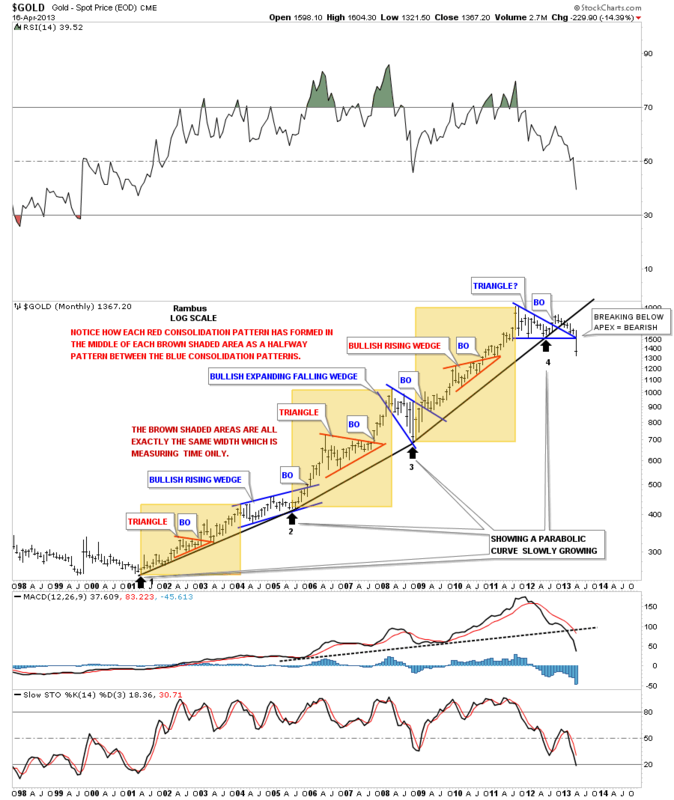 I just want to show you an update on the long term chart for gold that had shown a parabolic move off the 2001 low. The bull market was a thing of beauty creating one beautiful consolidation after another. I used this chart in my “All Hail the Queen” post to show the beautiful symmetry of this bull market. It wasn’t a week or so later, after the post was made, that the price action started to change When gold moved below the last black parabolic trendline I knew something was amiss. As you can see I was super bullish when I did that post but when the price action started to change I had to change with it no matter how bullish I felt inside. The breakout became more labored and just didn’t fit the bill anymore as to what a true breakout should be. Several months ago I labeled the apex of the last triangle, that was failing, showing that if the apex gave way that would be very bearish setup for gold. When gold broke below the apex, that is called, An End Around the Apex Move. The reason it’s so bearish is because, where the upper and lower trendlines intersect at the apex, that is where all the energy is focused. As you can see the energy was released to the downside in one big move. For those still wondering, if the scenario that I showed in the All Hail the Queen post is still valid, I have to say no because we have three failures. One, the blue triangle failed. Two, the last uptrend rail failed. Three, the apex failed. This isn’t supposed to happen and if one doesn’t act on what the charts are telling you, you will be feeling the pain for ignoring the information down the road as many staunch gold bugs are feeling right now. The trap has been sprung on the gold bulls and now it’s a game of survival. If I can just get out even I will sell, is the new mantra. So at this point most rallies will be sold by those trapped gold investors. The same situation is taking place in the precious metals stocks right now. Survival mode is taking over the psychology in the precious metals complex. One last note on the chart below. Even though the scenario didn’t work out as I expected it is still a very good study in the chartology of a bull market that lasted almost 13 years. It served me very well for many years.